The Kansas City Royals came into last season loaded with young, unproven talent, a team with a bright future, but also a murky present. A year later, the Royals head into spring training loaded with young, slightly more proven talent, but also a roster that might struggle to top .500. Eric Hosmer, Mike Moustakas, Johnny Giavotella, and Salvador Perez all claimed full-time jobs for the first time, joining Alcides Escobar to form baseball’s youngest infield. 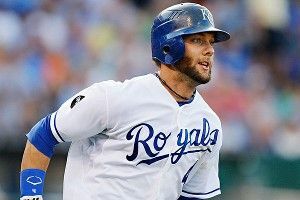 Alex Gordon finally fulfilled his potential and emerged as a star, Jeff Francoeur showed he’s more than a smiling face and an OBP black hole, and Melky Cabrera had a career year. The gang’s all back this season save for Cabrera, who got shipped to San Francisco for Jonathan Sanchez. That Sanchez, a walks machine who made just 19 starts in 2011, could be the team’s no. 2 starter, tells you what’s missing from this team: front-line starting pitching. Without it, this is an intriguing, fun-to-watch team … with third-place upside. Feel free to sub in ZiPS for some of these overoptimistic projections (Cain .306 wOBA per ZiPS vs. .334 per Bill James; Giavotella .309 wOBA per ZiPS vs. .334 per Bill James). Still, there’s some thump here, with Hosmer the biggest threat to go nuts on the league. The more subtle positive for the Royals is a team defense that finished 11th in Ultimate Zone Rating last year and could be improved in 2012. Though Cain’s chances of hitting .305 with pop like Cabrera did last year are slim to none, he could provide a massive defensive upgrade in center field; saving 15-plus runs more than Cabrera did with the glove last year is a possibility. If they’re going to overcome a mediocre rotation, an elite defense would certainly help. MLBDepthCharts.com lists Paulino as the no. 5 starter, but he’s probably better than anyone else the Royals have. Sanchez barely pitched half a season last year; Crow struggled with command and now must throw 100 more innings in his conversion back to starting; Hochevar and Chen both do a good job limiting walks, but neither misses enough bats to be a top starter (though the Royals still think Hochevar can start to take on the form that made him a no. 1 overall draft pick). Still, it’s Paulino, a scrap-heap pickup from the Rockies last May, who offers the most promise, striking out nearly a batter an inning and boosting his ground-ball rate last season. Royals starters struggled to go deep into games in 2011, ranking just 24th in innings pitched. But the bullpen figures to help on that front, with Greg Holland and Joakim Soria forming one of the best reliever duos in baseball last year, Jonathan Broxton signed in the hopes of a rebound season, and some promising young talent knocking on the door. Paulino. His trends are all pointing in the right direction, and he should blow away last year’s career high of 157 innings pitched, setting the stage for a big year. If you’re looking for an excellent semi-sleeper in your fantasy league, Paulino’s a great pick. Paulino and Hochevar give the Royals 400 better-than-expected innings, Hosmer becomes an elite slugger a couple years ahead of schedule, and the up-the-middle tandem of Escobar and Cain dominate defensively, helping give the Royals’ run prevention a big lift. Eighty-five wins and a second-place finish would be a long shot … but it is possible. Crow’s a bust in the rotation, Moustakas is slow to develop following last season’s weak results (.300 wOBA), and Soria gets hurt before he can be traded for a viable starting pitching prospect. Of course, if the Royals’ pitching falters, Mike Montgomery and Danny Duffy could get the call, which wouldn’t be a bad outcome for a team that’s likely a year or two away even in the best-case scenario.